Make yourself at home in one of the 217 guestrooms. Bathrooms with bathtubs or showers are provided. Featured amenities include complimentary wired Internet access, a computer station, and complimentary newspapers in the lobby. Event facilities at this hotel consist of conference space and a meeting room. A roundtrip airport shuttle is provided for a surcharge (available 24 hours), and free self parking is available onsite. This is a traditional hotel. Built in 1965 and renovated in 2010. Grab a bite at Golf Restaurant, one of the hotel's 2 restaurants, or stay in and take advantage of the room service (during limited hours). Relax with your favorite drink at the bar/lounge or the poolside bar. A complimentary breakfast is included. 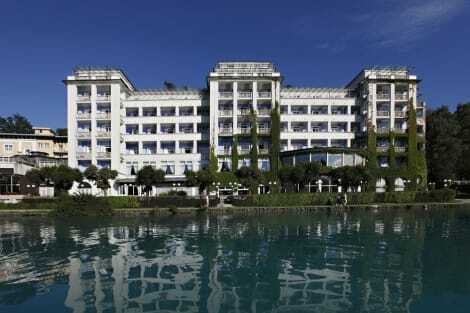 The four star Hotel Triglav Hotel is a traditional hotel right on the shores of spectacular Lake Bled. With more than a century of history, the hotel is steeped in fine traditions. Many activities are available in the area; the area is excellent for walking and cycling, and many water activities can be enjoyed on the lake. A nearby ranch offers horse riding, and in the winter months, the ski slopes are not far from the property. The nearest slopes are only two kilometres away, with the popular resort of Vogel a half an hour drive away. The lovely hotel has 22 rooms. There are 13 doubles, six singles and three suites. One room is adapted for guests with disabilities. All rooms are equipped with a private bathroom, cable TV, mini bar, telephone, safe and air conditioning. Many rooms have balconies. The hotel's restaurant serves the very best gourmet dishes. Guests can enjoy traditional Slovenian dishes with a modern twist. Flavours are fused together to create real mouth watering meals, and only the best fresh produce is used. The hotel also offers culinary courses. Twenty different wines are on offer, and can be enjoyed in the lounge in front of the cosy fireplace. The hotel also has a pool and a sauna for guests' relaxation needs. The hotel is located above Bleds’s rowing centre. The centre of Bled is only one and a half kilometres away, where visitors can soak up the charms of the old city and the lively atmosphere. There are free transfers between the hotel and city, and it can also be reached on foot. Wifi is available across the hotel. This hotel is very German/Austrian in style and is painted in a yellow colour with white trim. lastminute.com has a fantastic range of hotels in Bled, with everything from cheap hotels to luxurious five star accommodation available. 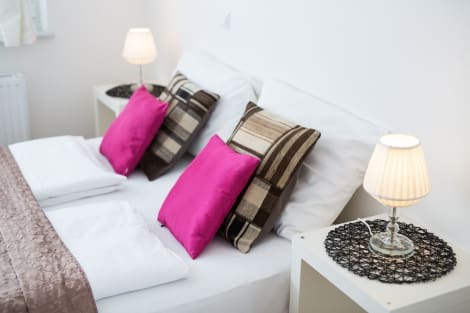 We like to live up to our last minute name so remember you can book any one of our excellent Bled hotels up until midnight and stay the same night.